We’ve managed a couple of visits to the Whitworth Art Gallery in Manchester since its reopening a year or so ago after a massive redevelopment. 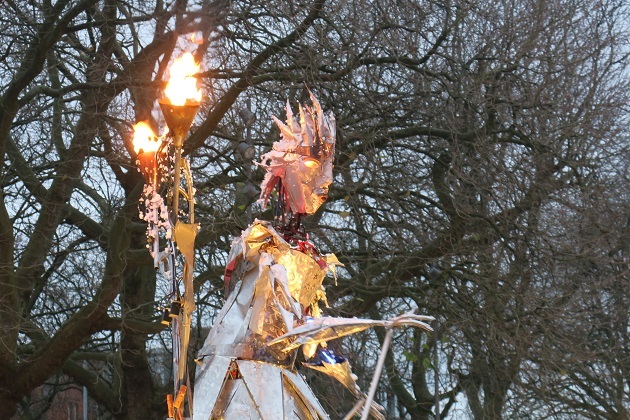 Back in the area recently and discovering a Frost Fair was happening in the grounds of the gallery, we decided it was time for a return trip. It was to be transformed into a “Scandinavian Wonderland” – not so sure I would agree with that rather ambitious description but it was a fun afternoon – a festive theme mixed with some art and culture, you can’t go too far wrong with that. Strolling through the park to reach the gallery we came upon a game of Quidditch. Son was thrilled and amazed – we’ve never seen this before. Two teams were battling against one another with broomsticks in tow. 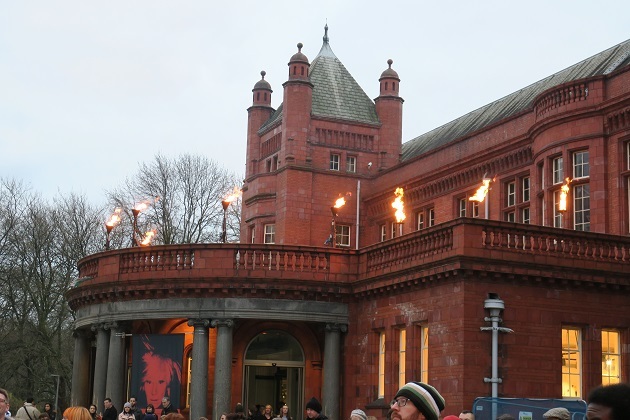 The Whitworth Art Gallery is a wonderful building – all red brick and traditional at the front, the back (thanks to that redevelopment) is quite the contrast with a contemporary glass wall and walkways looking out over the park. I love the contrast and the mix of old and new together. 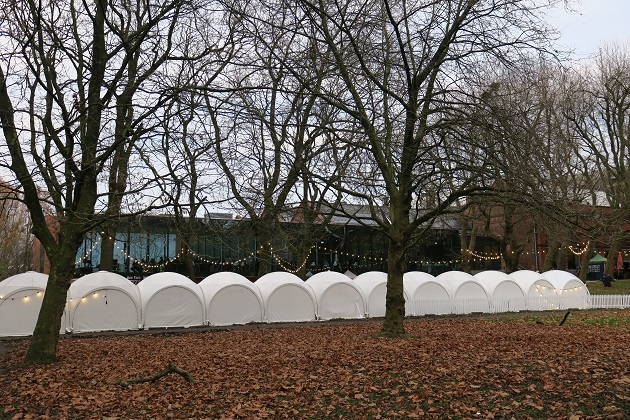 Today though there were a whole series of little white structures all around the building – the Frost Fair was underway. 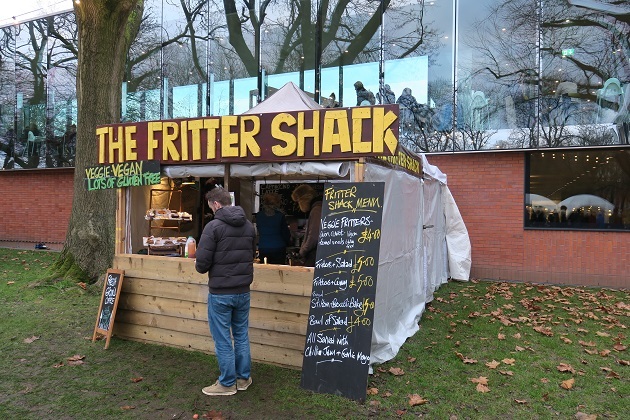 We found stalls selling a variety of arts and crafts and browsed for a little while before Son spotted the food trucks. Three in total but with eyes like a hawk he pointed out one was selling crepes and promptly joined the queue. 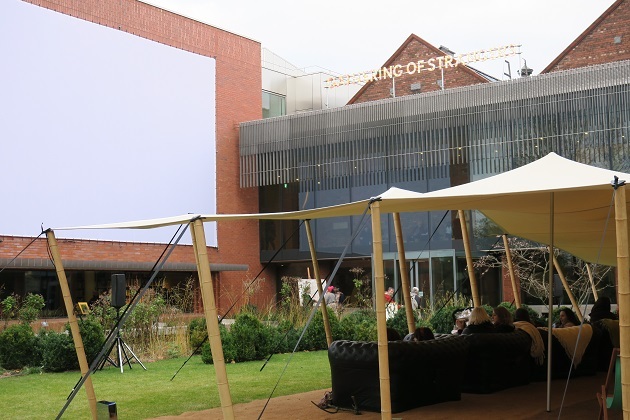 An outdoor cinema with giant screen and a whole series of sofas had taken up residence at the other side of the gallery building. No takers amongst our gang – the thought of shivering on a sofa watching a movie didn’t appeal too much to me. They did supply blankets but still… The movie was Moomin related – that didn’t appeal too much to Son, sadly his Moomin days are long gone. 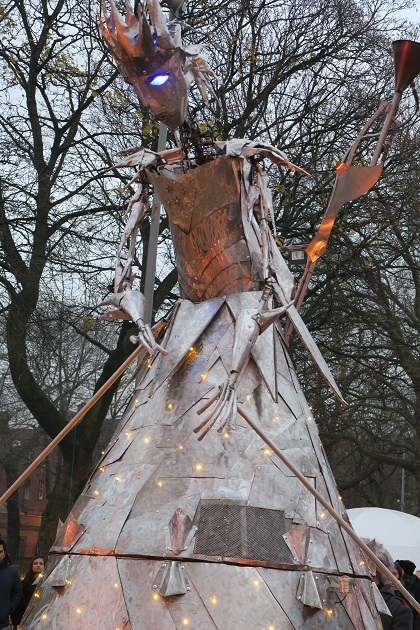 A small ice rink at the front of the gallery looked a bit disappointing but we were more intrigued by a giant iron sculpture – the Ice Queen – and the fact she was going to “perform” in half an hour’s time. We took this chance to go into the gallery, free entry means it doesn’t really matter if the visit is brief. There were lots of arts and craft activities going on inside for younger children and a storytelling tent was pitched in the middle of one room. 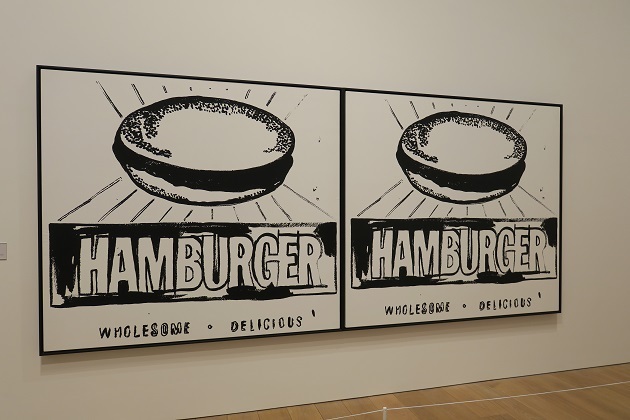 We browsed and checked out the new Andy Warhol exhibition. Back outside in time for the performance, we waited while Walk the Plank, a well known outdoor arts company in these parts got the Ice Queen ready. 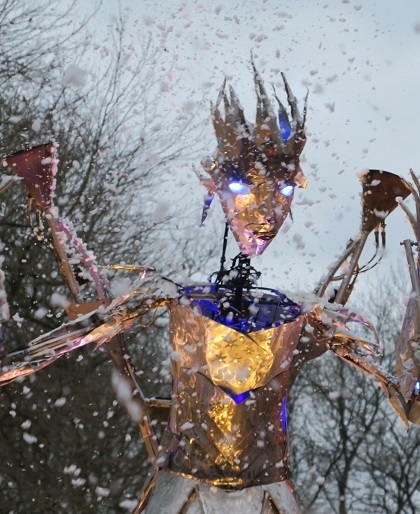 The huge iron sculpture moved slowly around the courtyard, bowing and moving her arms then producing snow and fire. It was all very simple but innovative and strangely compelling. Son was sceptical at first however even he had to admit to being intrigued and enthralled by the whole thing. A perfect end really to our arty afternoon out. What a lovely way to spend the afternoon. It’s a long time since I visited the Whitworth but I love how architects manage to combine old and new buildings so well – John Ryland’s being another local example of historic and contemporary blending into one. I love John Rylands’s too – like you say they’ve done a great job with the old and new – it’s such a special place. Never heard of quidditch before–that’s a new one for me. The Ice Queen looks quite intriguing and I’m sure the show was quite a sight to behold. Looks fun! It’s from Harry Potter (I only know through my son!!) but we never knew it was played in the “real” world. The show was lovely – a bit quirky and alternative and fun to watch. That Ice Queen sculpture looks pretty impressive. I am sure my kids would have been delighted to see her belching both flame and snow. It was fun to watch – so simple but so well done and very different! I like the look of that performance, a very interesting concept! It was great – very different and quirky, I love things like that! The Ice Queen looks wonderful. 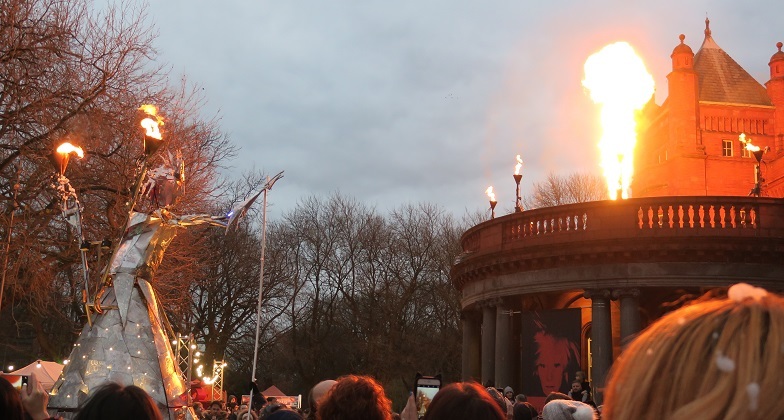 She was magnificent – especially with her fire and snow!! Ooh, I like an arty afternoon out. Can’t believe they were trying to play Quidditch! The Ice Queen performance looks wonderful. We were excited about the Quidditch – never seen that before! The performance was wonderful, very quirky and different and so much fun. Joy, the Ice Queen certainly looks interesting, glad it was a wonderful afternoon! Crepes would have been enough for me! It was so much fun Pam – those crepes were delicious too! It sounds like a great afternoon! It was lots of fun and something for everyone! Definitely – I loved it too! Wow, the Ice Queen looks like quite something! 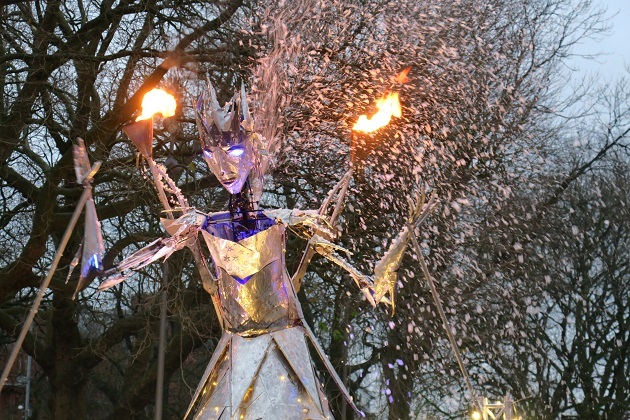 She was fantastic – especially shooting out “snow” and fire! I hadn’t expected the Ice Queen to move! Awesome! That must have been quite a sight! She moved very sedately between all the people Reggie, so impressive and more so when she spurted fire and “snow”. The metal sculptures are so captivating. Frightening yet elegant. What a great experience. It was quite surreal but so well done! It’s a wonderful gallery Rosemary, we’re very lucky to have it so close and be able to pop in frequently. Can’t believe Christmas is all over and done with now – first day back at school for our son so first morning getting up early – it wasn’t easy for any of us!! Hope your Christmas was a lovely one too. Yes we had a lovely time thanks Joy! I dislike getting up early in winter so hope the first day back at school went well for your son! Our daughter is back at work in London too today. Long summer hols here – school doesn’t go back until beginning of February!